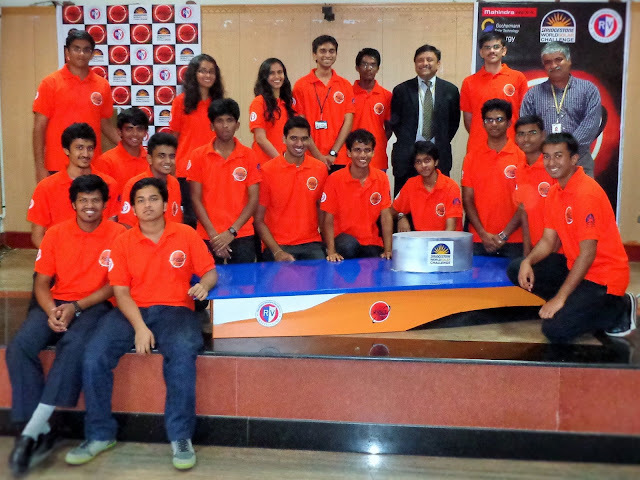 The RVCE Solar Car Team is an Indian team dedicated to taking part in the prestigious World Solar Challenge in Australia. It will travel from Darwin to Adelaide - a distance of 3,012 kms - entirely on solar power from October 18-25 this year. A solar powered car designed by BENGALURU city-based engineering students. A team of 20 students from RV College of Engineering is providing finishing touches to Soleblaze, a single-seater car. Backed by a host of corporates and experts including electric car pioneer Chetan Maini, who cofounded the Reva electric car, the Rs 2-crore Soleblaze will compete among 45 solar cars, including those designed by the Massachusetts Institute of Technology, Stanford and Cambridge universities. "At the moment,India does not produce a single vehicle that is solar-powered. We only have battery operated vehicles. There's no vehicle that has solar panels on its hood like this one.This is a gamechanger,"said Vikas Mathur, managing director at Ikaros Kinetic Solar, who is on the advisory board besides Maini. Soleblaze does not have an engine,explained Vikram R Nath, a final year mechanical engineering student, who is leading the team. "We have a solar array on which sunlight falls. It is connected to a maximum power point tracker to ensure that the amount of voltage is optimum. From this, it goes to a 5 kWh battery where it is stored.The power is drawn by a motor that is controlled electronically to run the vehicle," Nath said. Work on this project started in September 2013, but it has not been an easy journey , the students said. "We started by telling ourselves, you don't have to be great to start, you need to start to be great, and not all components are available in India," Nath said. The team has collaborated with 30 companies on this project for various aspects. The integration will be carried out under the guidance of experts at Mahindra Reva.Many US-based technology firms have also pitched in for various aspects of the car's development. "We are happy not a single company rejected when we approached them," Nath said. Every Indian should get a motivation from this renewable energy project. Well-done students..you have made India proud...!